It seems that even after more than 30 years making one hell of a noise behind the kit, thrash legend Dave Lombardo is still in love with drumming. The Slayer sticksman told the Heavy Metal Examiner that there's little chance of him becoming sick of his day job any time soon. 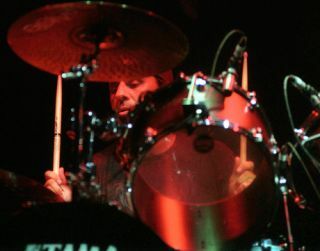 He said: "I love playing drums, and I love being on stage, and I love recording. It's my life… it's been my life all my life, and I don't think it could ever become boring for me." Dave also revealed that he doesn't just want to be known as drummer for the thrash pioneers. "Let's say that everybody knows me from Slayer. Hey, I don't just play Slayer; I know how to play other things. That's always been the top of my priority list ever since I left the band in 1992 — to show the world that I am much more than just a metal drummer." To read more from Dave pick up the latest issue of Rhythm, which includes a killer big four of thrash cover feature.